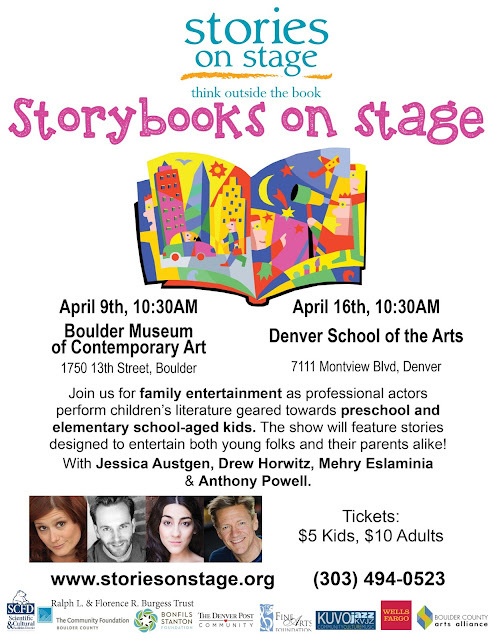 Stories on Stage presents "Storybooks on Stage" on Saturday, April 16 at 10:30 a.m. at the Denver School of the Arts (7111 Montview Boulevard). The show features professional actors (Jessica Austgen, Drew Horwitz, Mehry Eslaminia, and Anthony Powell) performing children's literature by local and national authors, is geared for preschool and elementary school-aged kids, and is designed to entertain both young folks and their parents alike! Tickets are $5 for kids and $10 for adults - click here or call 303-494-0523 to learn more. Check out this great Colorado Public Radio story about Stories on Stage to learn more about the group.